The scale of this work is hard to grasp online. Although the cameras must be a few years old, the resolution of the sequenced digital images would still better today's best HD video. These should be shown as large as possible. Anyone up for hacking the Reuters sign in Times Square? In a new project I'm exploring extended on-location shoots. Some of these last a full day. When I read about this guy, I had to put a quick article together about him. 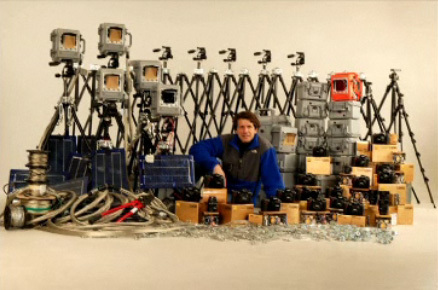 James Balog has 33 solar powered cameras in place high across the northern hemisphere. They're protected with a specialized housing because most of them are in the arctic, anchored to bedrock on the edge of glaciers. He's shooting one frame every hour and capturing years worth of data. The project is called the Extreme Ice Survey and it is impressive. The scale of the landscapes he shoots are on par with our largest cities. Viewing a time lapse sequence that spans months, one sees walls of ice 4 miles long crumble, recede and regrow with pulsing regularity. The earth appears to be breathing. Many images that quantitatively measure dramatic climate change on this scale are taken from satellites in space. The effect is often counter-productive to the eco-friendlies who are preaching their power. The great distance and awkward perspective work against the viewer - buffering any emotional connection to what's happening. And, satellite images are often seen sporadically - two or three images are compared across multiple years. In contrast, the sequences Balog is capturing are scientifically valuable and emotionally charged. "Most of the time, art and science stare at each other across a gulf of mutual incomprehension. There's a great confusion when the two look at each other. Art of course, looks at the world through the psyche, the emotions, the unconscious at times - and of course, the aesthetic. Science tends to look at the world through the rational, the quantitative, that which can be measured and described. But it gives art a terrific context to understanding. And in the Extreme Ice Survey, We're dedicated to bringing those two parts of human understanding together. Merging art and science to the end - helping us understand nature and humanity's relationship with nature better."